When I posted the first pics of my Deathwing Librarian, it was met with mixed reviews. I wasn't looking for rave reviews as much as I wanted to share with you guys how I went about painting him. 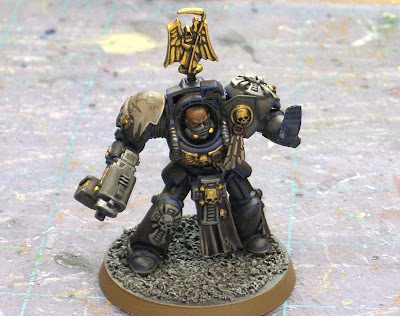 One of the comments was along the lines of "Why isn't he blue, if he's a Space Marine Librarian?" A perfectly valid question and one that made me realize that I pretty much failed at hitting the mark when it came to "showing" he was a Codex scheme Librarian to players who aren't completely familiar with Space Marine characters. I've since gone back and added an Asurmen Blue wash to the model. I think it helps some, but I know that for it (the technique) to really work, I'll need to strip the model, perfect the technique and start over. I'm not going to do this, but I want to share how I go to this point with this kind of painting. In order to prevent the terrible huge wall of text, I'm going to break this whole thing up into a couple of posts. See if you can answer what the following things are. It shouldn't be hard to do if you've been playing for any length of time. I've picked these particular items for specific reasons. 1. What creature is this? 2. 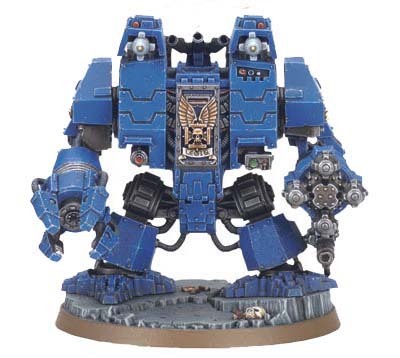 What Space Marine Chapter does this dreadnought belong to? 3. 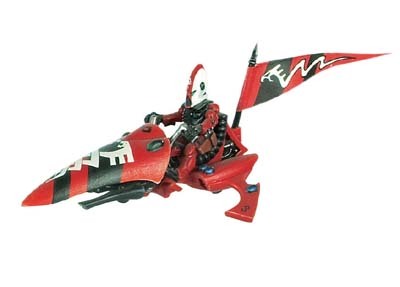 What army does this specific jetbike represent? Once you figure out the answers, try and figure "why" I chose these images in particular and what it is about them that makes them important. Check out the answers and explanations here. 1. Genestealer with a wierd bum. 2. Ultramarines, he's blue with gold. I'm going to guess it has something to do with the importance of distinct silhouettes, defining color schemes, and... pointy hats? Perhaps you chose them because they are easily recognizable. They are idonic in their own way. Blue for ultramarines, genestealers for tyranids and the red for saim-hann? Don't let the unwashed masses get you down. "Why isn't your Librarian blue?" Oh, maybe because he has the shape/profile, color scheme and iconography of a Deathwing Librarian? He doesn't have to be blue. There is plenty of stories out there of librarians who wear there chapter colors. Techmarines too, they dont have to be in red. I do believe that if you are going to use blue then it needs to be that bright blue that we are used to seeing on librarians. I think a librarian would either use the traditional blue of most librarians or his chapters colors. 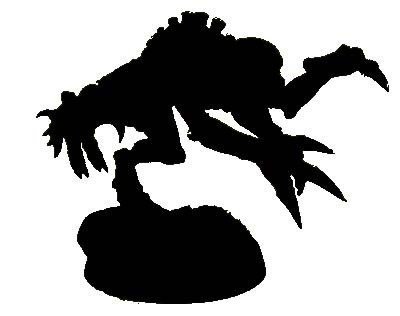 I'm guessing that you are saying that the Genestealer is recognizable because of it's shape, the Dread is recognizable as an Ultramirine because of it's color, and the Saim-Hann bike is recognizable because of it's iconography... but I don't really know where you're going with it. I wait on bated breath for the rest of the lesson. If i were to put my teacher hat on I'd say we're abou to wander the shallows of the waters of semiotics and talk about the signifiers that enable us to "read" an image or object (text). In each case there are clear signifiers to an audience in the know as to what each example is. wheras I expect you are going to posit the question "why dosent my librarian "read" as a librarian" to those complainers. what do we expect from a librarian? Blue colour, psychic hood, force weapon, lightening/book iconography i guess would be the shortlist, at the end of the day its about conformity to expectation. When you sit down to redesign somehting, in order for it still to "read" as the intended, it needs to retain some of the signifiers of that previous incarnation. becuase ultimately this hobby is about creativity and if we cant vary what we do, then why not sell the mini's prepainted? i think it simply comes down to this, keep a little, change a lot, but ensure YOU are happy that your model represents it's intended subject, wether other people can read it or not. I think you're trying to tell the importance of chapter/squad markins for space marines compared to other armies for which model shape/color immediately make it distinguishable. This is indeed an issue in 5th edition where multiple squads can enter one big melee and your tacticals and devastators and whatnot become hard to tell from each other.. I got all the minis, you picked them because they are all emblematic of their respective armies? I.e. when you see one of these figs, you instantly think "Ultramarines", or "genestealer". The connection with the earlier portion of your post is that the 'lack' of blue indicative to librarians might have made it hard to recognize as what it truly was. Yeah, when I saw your lib the first time...i was wondering why he was a little dark. theyre all social constructs, we are taught to think that these objects represent different things by their creators and the community, to my eight year old daughter these are all just plastic toys. -2 why my chaplain isnt black (mortifactor fluff states chaplain Astador as wearing red, therefore i use a deep red for mine). -3 if i play chaos (the Mortifactors have alot of skull imagery, apparently only associated with chaos). there will always be questions like these, i usually just explain and ignore. Otherwise, I'm going to guess this has something to do with shading. Instead of stripping the paint from the model, you can always give it a short shot of white from an airbrush or primer can, slightly so just only the most protruding parts of the model get covered with a thin layer of white. Then you can go over it and blend the new blue color. Some GD winners have wrote tutorials on how using this technique allows for a control of light and color hues on models. The bad part is you'll have to retouch other parts of the model as well, but it's a good technique and faster than stripping it all and starting all over. I like your librarian actually, and black suits for Dark Angels Terminators (older fluff ftw). If you *have* to do blue at all, I like how it did a very subtle blue for the librarian. I've personally disliked the whole "color guard" mentality in Space Marine armies and never follow it. My Ultramarines librarians just got lucky, 'cause they were already blue! It gets a little silly, your army's what you make it, and putting five different, distinctly colored troops under the same banner just seems silly. Even the most basic gobbo can figure it out; "Need stop tanks? shoot da red 'unz. Need stop 'eadaches? Shoot da blue 'unz..."
Oh, and all the pictures are iconic because they conform to the fluff. Everyone will say "Ah, Imperial Fists" when I open my army transport because they are part of the fluff. Had I painted them in my own scheme they could have been anything. i got some strange comments when i painted my chaplain white rather than black, but the best comment came from a GW black shirt and all he said was... "its your model... paint him pink if you like". i think the model is good and it fits with the other DW termies you have done.